THE EPO has said absolutely nothing about the UPC for a long time, except indirectly. Almost 2 months! The EPO no longer wants to look foolish by speaking about something which it knows will never materialise. Even the PR/communications people no longer mention the UPC. Sometimes we feel/think that the EPO’s PR people know that their time there might be running out or is very limited, so they just pretend that things are rosy, in order to collect more salaries and build up savings before the Office implodes. “Sometimes we feel/think that the EPO’s PR people know that their time there might be running out or is very limited, so they just pretend that things are rosy, in order to collect more salaries and build up savings before the Office implodes.”The same goes for Team UPC; at this stage these people are just lying to themselves and to one another. It’s worrying to watch. The same goes for US law firms whenever they speak about Alice. The electronic archives of the European Patent Office are to be housed in Luxembourg, using the same model of the Estonian e-embassy, according to our sister publication Paperjam. In 2017, Luxembourg signed an agreement to establish Estonia’s first “data embassy” in the grand duchy in early 2018, with Estonia allocating €2.2 million for a five-year rental agreement. The virtual embassy is located in a data centre in Betzdorf and will be operated by the Luxembourg government’s centre for information and technology (CTIE). The same data centre is used by the European Commission and Nato, among others. With the exception of few in Luxembourg [1, 2], the political establishment there likes it. A lot of cash is derived over there from rather dodgy operations (tax evasion being the more notorious among them). A coalition of companies holding patents in Europe has welcomed conclusions released this week by the Council of the European Union on tougher enforcement of intellectual property rights. 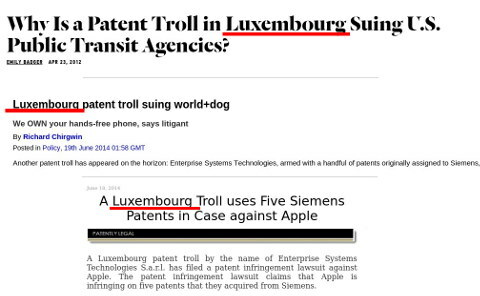 But the group raised concern that the conclusions failed to recognise the steady rise in the EU of patent-assertion entities, or patent trolls. The European Council of ministers on 12 March adopted a set of conclusions on the enforcement of intellectual property rights in the European Union, aimed at improving protection in the digital era and promoting innovation (IPW, Europe, 12 March 2018). This includes a list of suggested actions, including possible changes to national laws and judicial systems, bolstering customs, agreements with industry, encouraging open source, strong representation at the World Intellectual Property Organization, and possibly setting up an IP watch list reminiscent of the one in the United States. The recent ground breaking report by Darts-ip, the world’s leading authority in intellectual property case law data, demonstrates that Europe’s innovation ecosystem and Europe’s operating companies are under increasing attack from Patent Assertion Entities (PAEs), also commonly known as “non-practising entities” (NPEs) or “patent trolls.” There has been a 20% year-on-year jump in PAE litigation. US-based PAEs initiated most of those suits (60%) and targeted applications of information and communication technologies (ICT) (75%). As application of ICT is central to innovation and growth across many industries, the consequences of these attacks will be far-reaching. Most importantly, data shows that it is not just large companies who are affected — almost a quarter of the unique defendants are European SMEs. Germany is the preferred venue, with 20% of all German patent litigation having been brought by PAEs.